Click the map for a guide to the other subspecies. Adult male, Siskiyou mountains, Siskiyou County Adult male, Sutter Buttes, Sutter County. 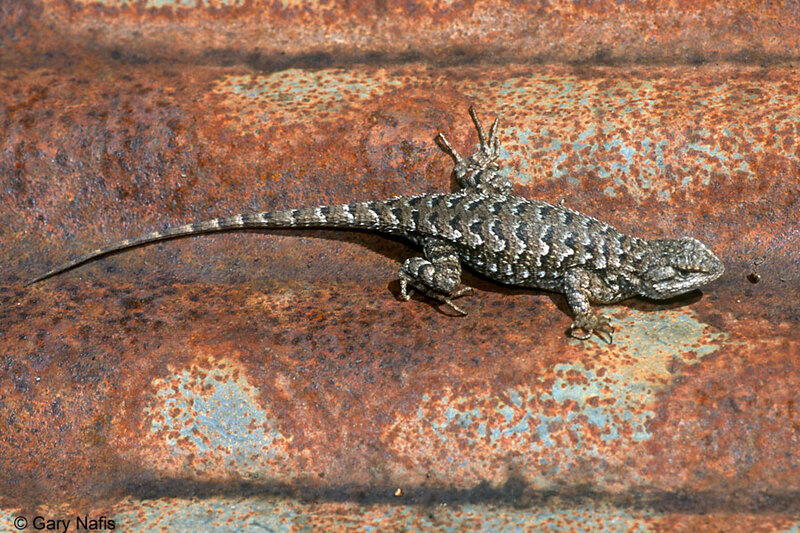 Sometimes fence lizards are very dark before they have warmed up in the sun. They can look like they're completely black at a distance. 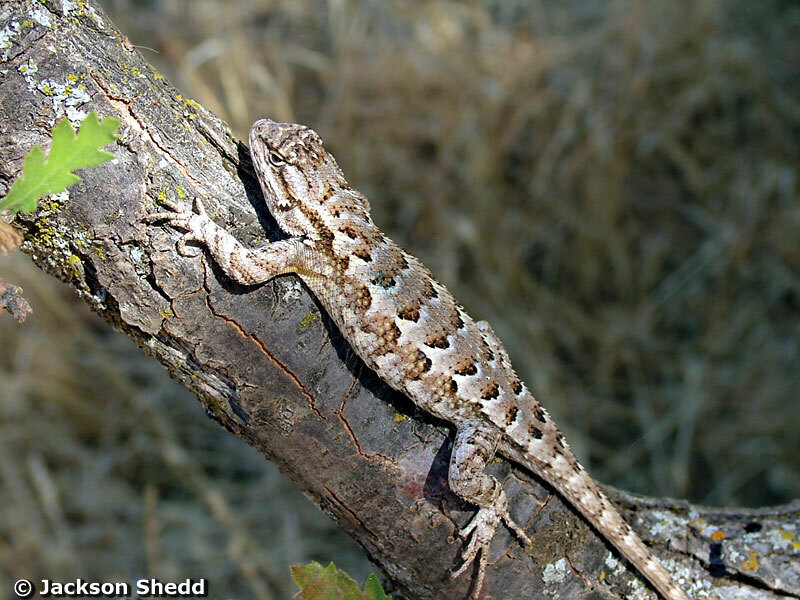 Adult female, Stanislaus County © Joe Lovell Western Fence Lizards have overlapping keeled scales with spines on them over much of their body. 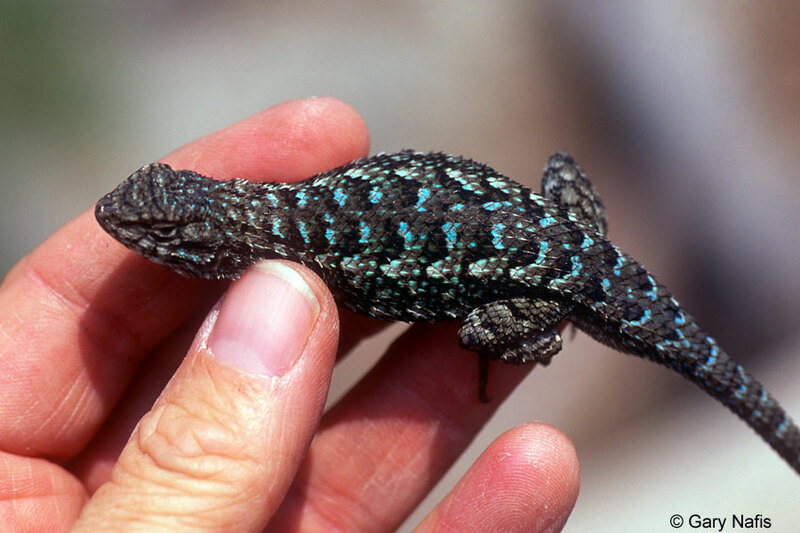 Juvenile fence lizards are preyed upon by many other animals, including the black widow spider. © Rory Doolin Sean Kelly © shot this series of a California Striped Racer eating a male Great Basin Fence lizard in San Diego County. Adult male with ticks on the side of his head. 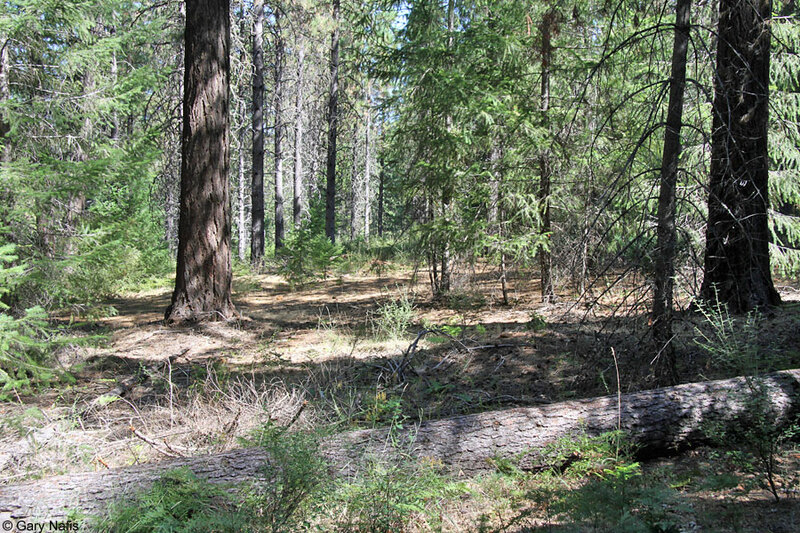 In California, western black-legged ticks (deer ticks) are the primary carriers of Lyme disease. Very tiny nymphal deer ticks are more likely to carry the disease than adults. 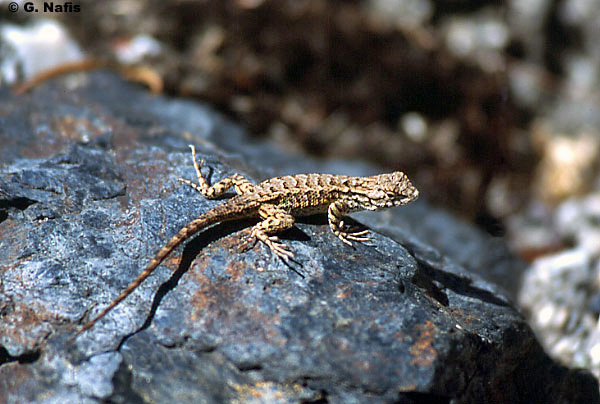 A protein in the blood of Western Fence Lizards kills the bacterium in these nymphal ticks when they attach themselves to a lizard and ingest the lizard's blood. This could explain why Lyme disease is less common in California than it is in some areas such as the Northeastern states, where it is epidemic. Sean Kelly found this juvenile Southwestern Speckled Rattlesnake eating a Great Basin Fence Lizard behind his garbage can one afternoon in San Diego County. 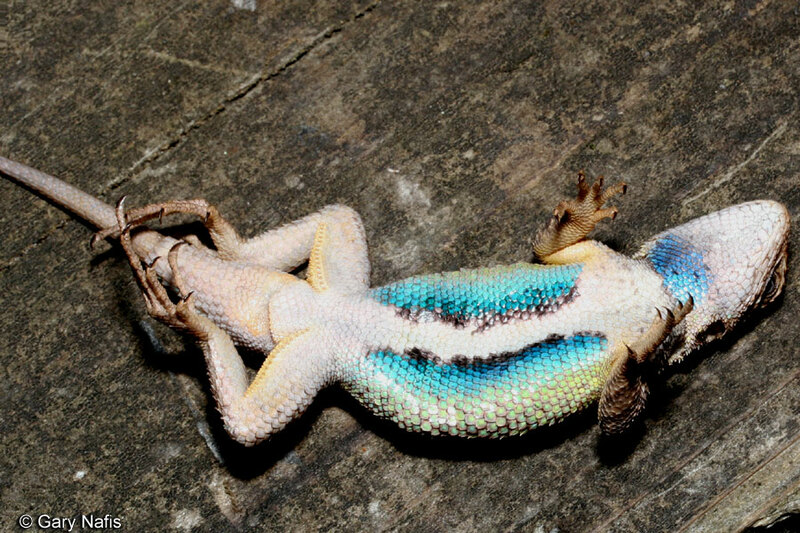 The lizard shown directly above was found in a freight container containing only metal boxes at the BMW plant in Dingolfing / Bavaria / Germany on Oct 17, 2006. The container was shipped from Stockton CA on Sep 14, 2006. 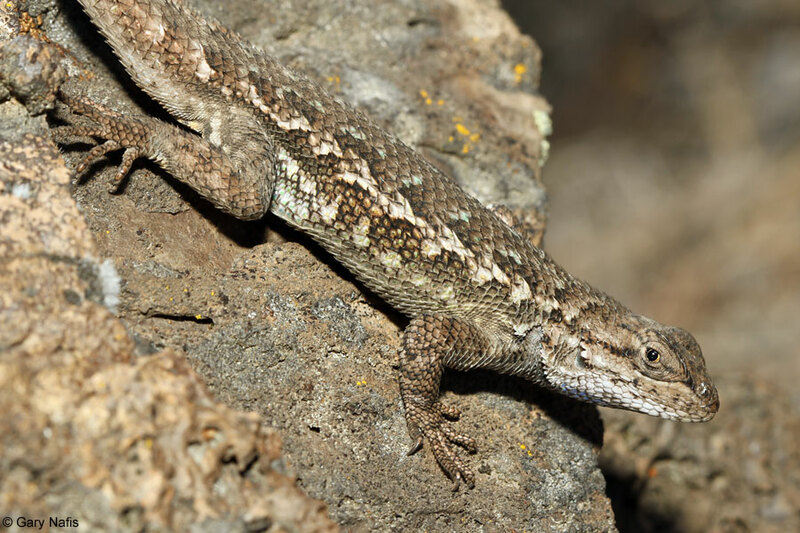 The lizard survived a 33 day voyage without food and water. The container was placed most likely on the top deck of the vessel and hence cooled down considerably at night which explains the good condition of the animal upon arrival. Many species of plants and animals have been introduced into areas of the planet where they did not naturally evolve. 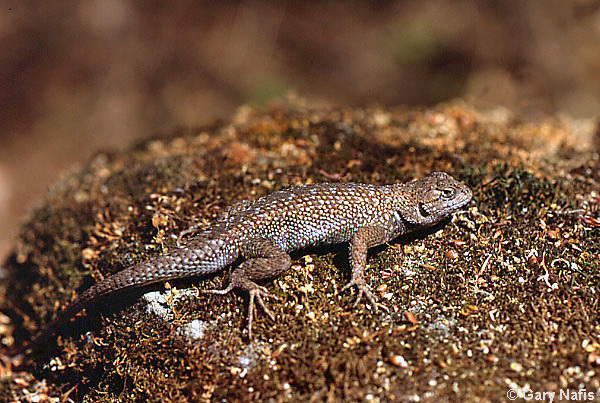 The journey of this lizard illustrates one way animals can spread around the globe: If the lizard was a gravid female who found conditions favorable to her survival once she arrived, laid her eggs, and eventually the offspring began reproducing, or if other lizards arrived at the same location and bred with her, then an established breeding population could develop. 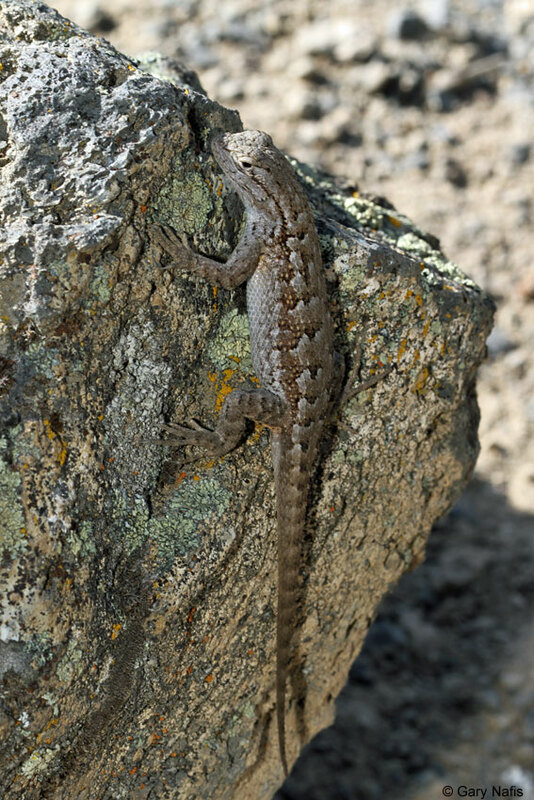 Sierra Fence lizards run around a rocky area in the woods 8,000 ft. high in the Sierra Nevada mountains. 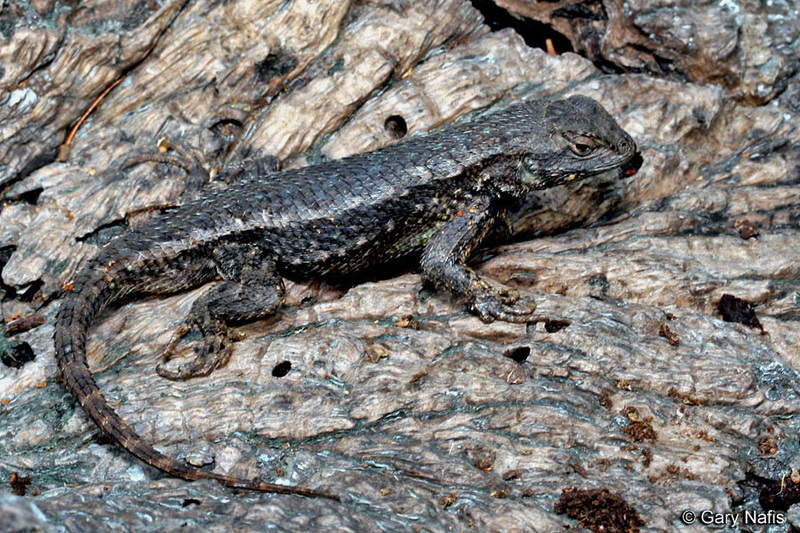 A Sierra Fence Lizard, or intergrade, runs around rocks in the forest up at 5,600 ft. in Tuolumne County. 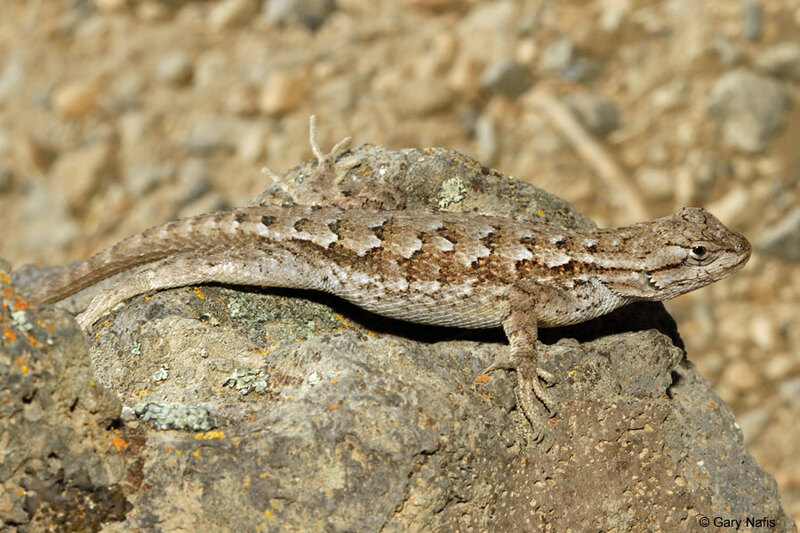 A male fence lizard in Inyo County defensively showing his throat color and doing push-ups. 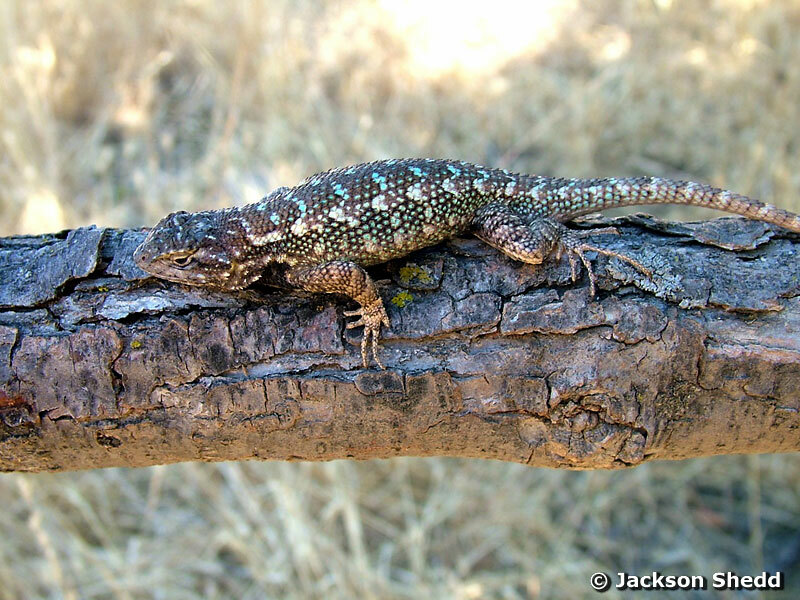 San Joaquin Fence Lizards on trees along a river in early spring. 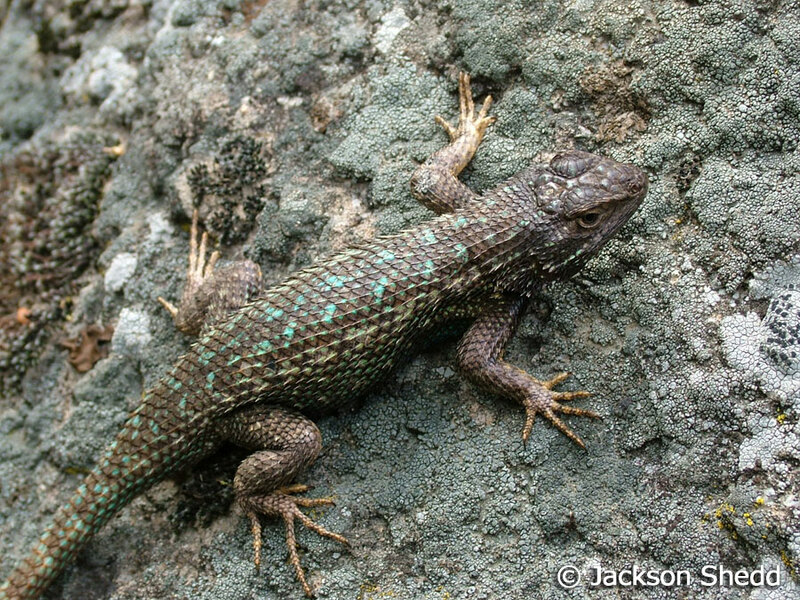 A few fence lizards in Contra Costa County. 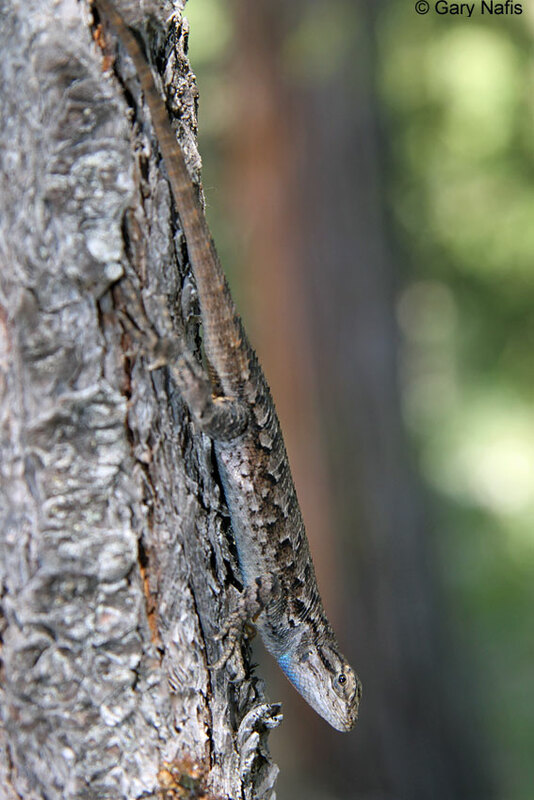 A male fence lizard on a tree in Alameda County. Several juvenile fence lizards come out to bask in the sun on a cool and windy morning in early March. 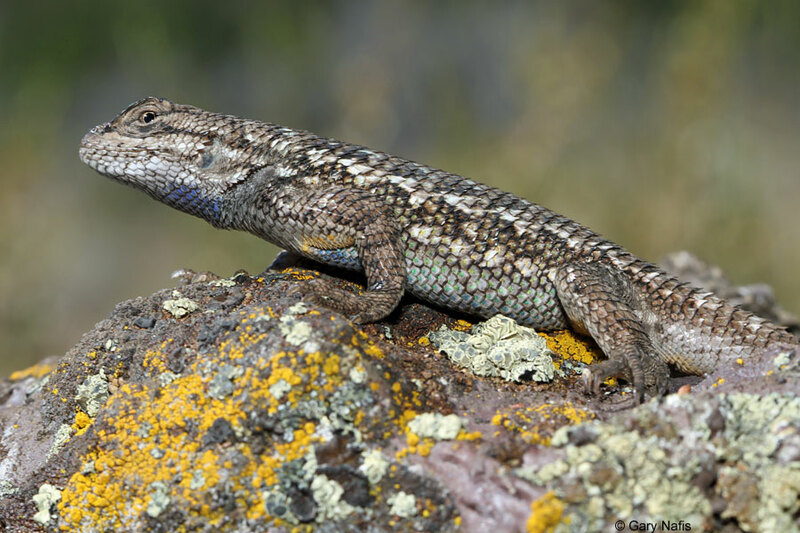 Two Coast Range Fence Lizards, Sceloporus occidentalis bocourtii, are observed during the breeding season in early May in San Benito County. 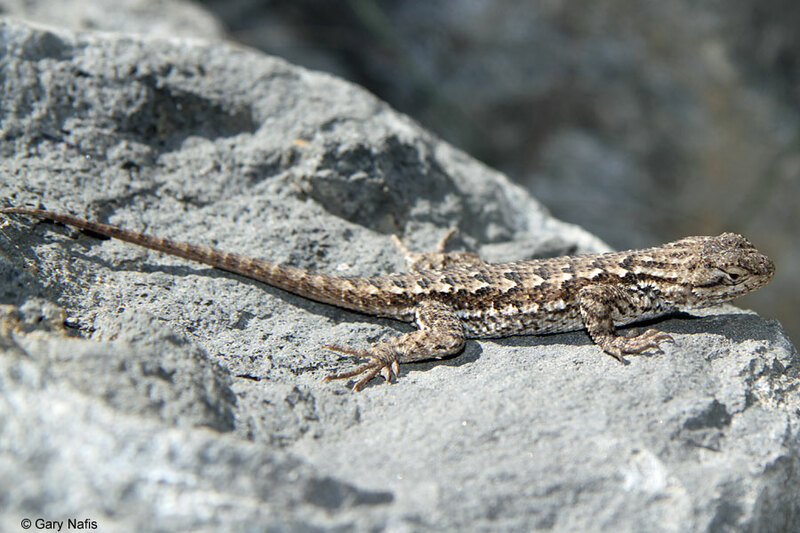 The first lizard, a female, has moved from her perch on a rock to a nearby rock in order to get away from the photographer. She begins a territorial push-up display when a male comes up the side of the rock and begins to pursue her. She arches her back and hops away in order to reject him. She may have already mated and is bearing eggs, or maybe he is not her type. He finally stops and does a push-up display, possibly to continue trying to entice her, or possibly to warn the photographer that this is his territory. 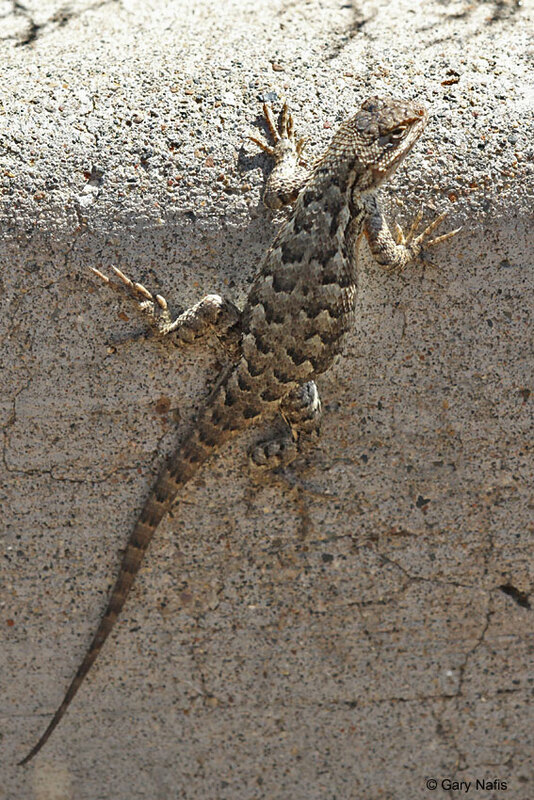 A female fence lizard runs across a wall in Riverside County and encounters a male who pursues her. She rejects him and he runs to an open spot on top of the wall and does a push-up display. 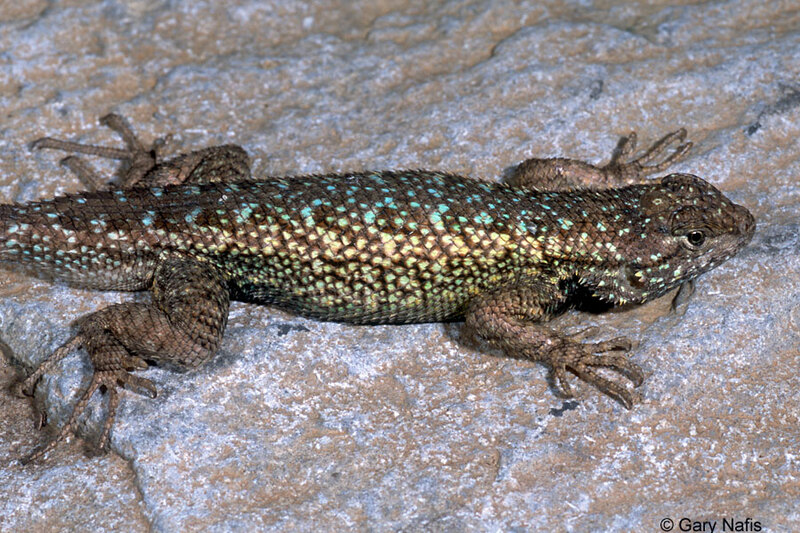 Large, dark phase Great Basin Fence Lizards bask and eat ants off rocks in Inyo County. 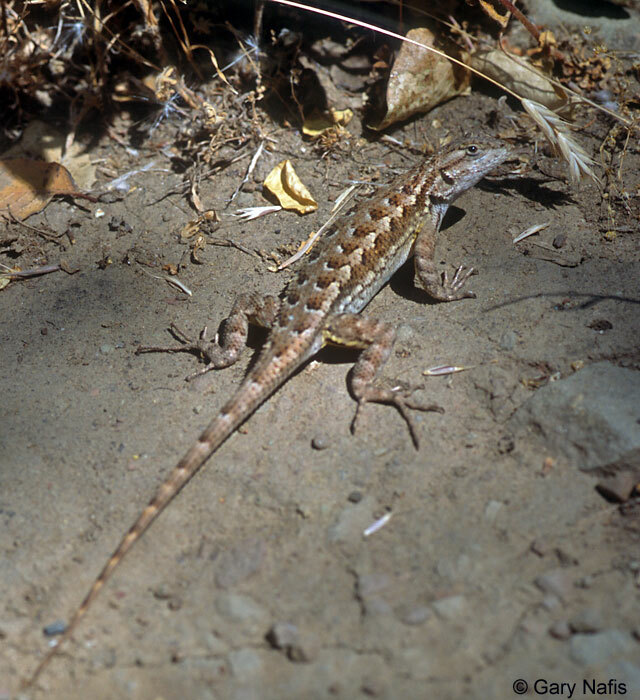 A fairly small lizard with large overlapping keeled scales with spines on them on the back and sides. 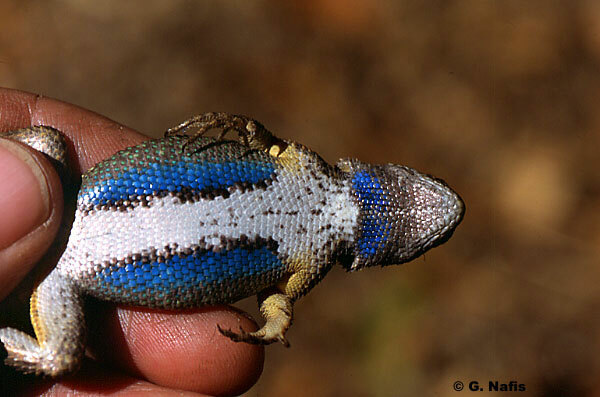 Scales on the backs of the thighs are mostly keeled. Color is brown, gray, or black with blotches. Sometimes light markings on the sides of the backs form stripes or irregular lines, and sometimes dark blotching may form irregular bands. The rear of the limbs is yellow or orange. The sides of the belly are blue. The belly is light in color. enlarged femoral pores, and a swollen tail base. 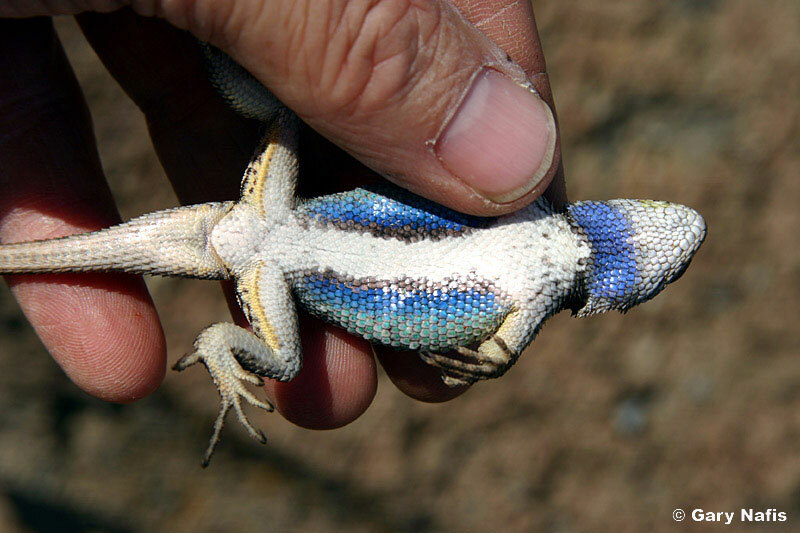 Some scales on a male's back become blue or greenish when he is in the light phase. 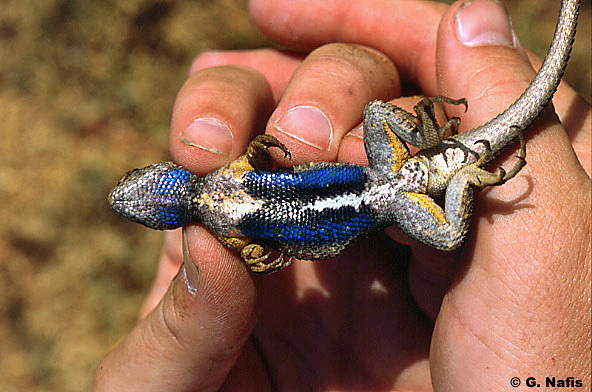 Females have faint or absent blue markings on the belly, no blue or green color on the upper surfaces, and dark bars or crescents on the back. 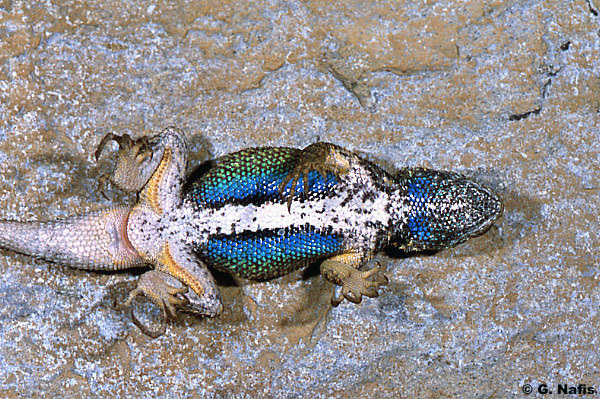 Juveniles have little or no blue on the throat and faint blue belly markings or none at all. Often seen basking in the sun on rocks, downed logs, trees, fences, and walls. 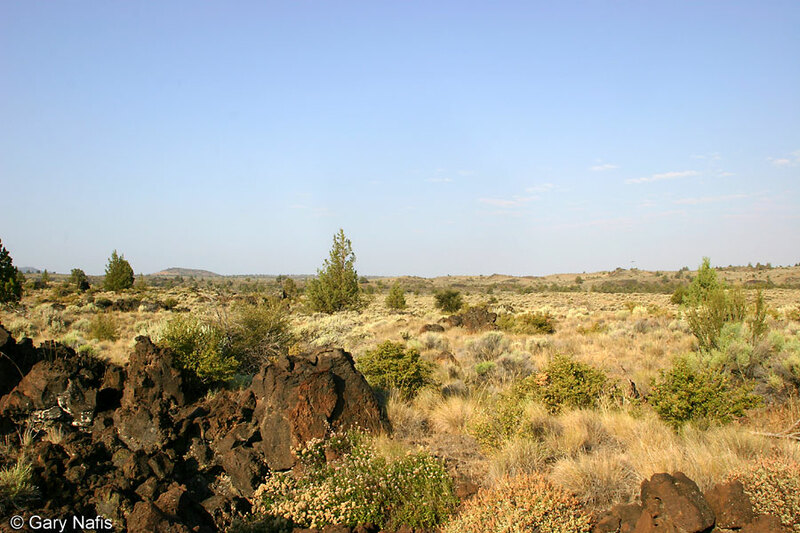 Active when temperatures are warm, becomes inactive during periods of extreme heat or cold, when they shelter in crevices and burrows, or under rocks, boards, tree bark, etc. Common and easily encountered in the right habitat. 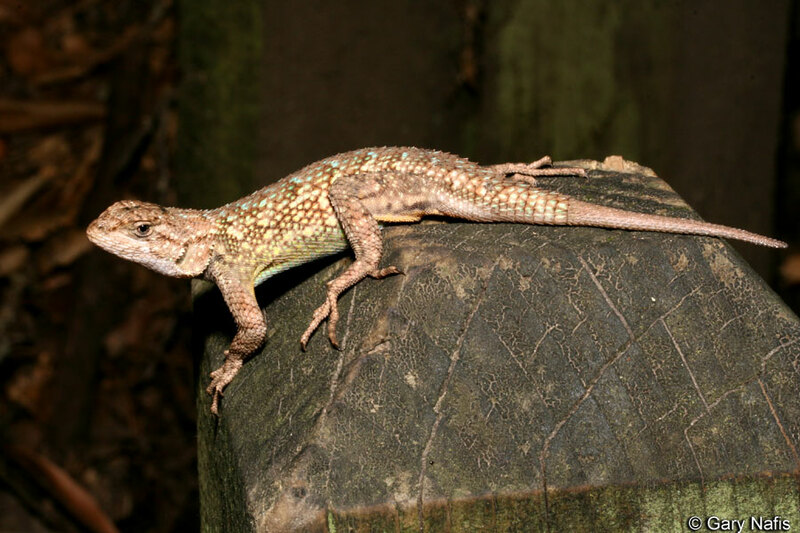 This is probably the species of lizard most often seen in the state due to its abundance in and near populated areas and its conspicuous behavior. Males establish and defend a territory containing elevated perches where they can observe mates and potential rival males. Males defend their territory and try to attract females with head-bobbing and a push-up display that exposes the blue throat and ventral colors. Territories are ultimately defended by physical combat with other males. 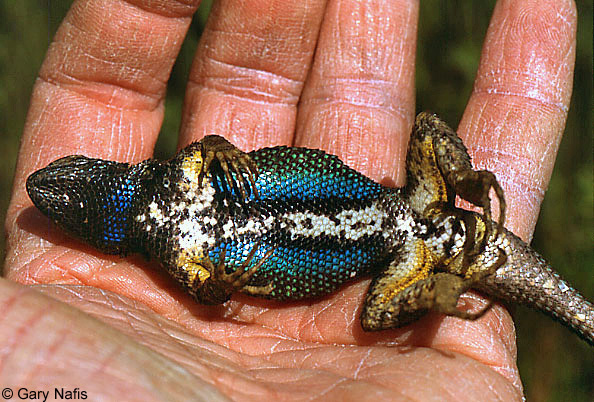 The tail detaches easily to distract a potential predator allowing the lizard to escape. 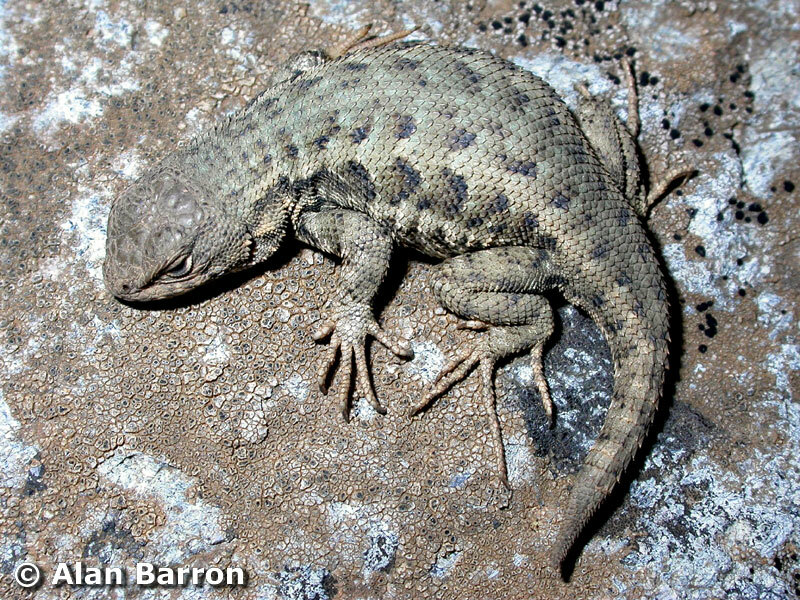 Eats small, mostly terrestrial, invertebrates such as crickets, spiders, ticks, and scorpions, and occasionally eats small lizards including its own species. Mates in early to late spring, depending on the elevation of the location. Courtship and copulation typically occurs from March to June. Egg laying occurs 2 - 4 weeks after copulation. Females dig small pits in loose damp soil where they lay 1 - 3 clutches of 3 - 17 eggs usually from May to July. Eggs hatch in about 60 days, usually from July to September. 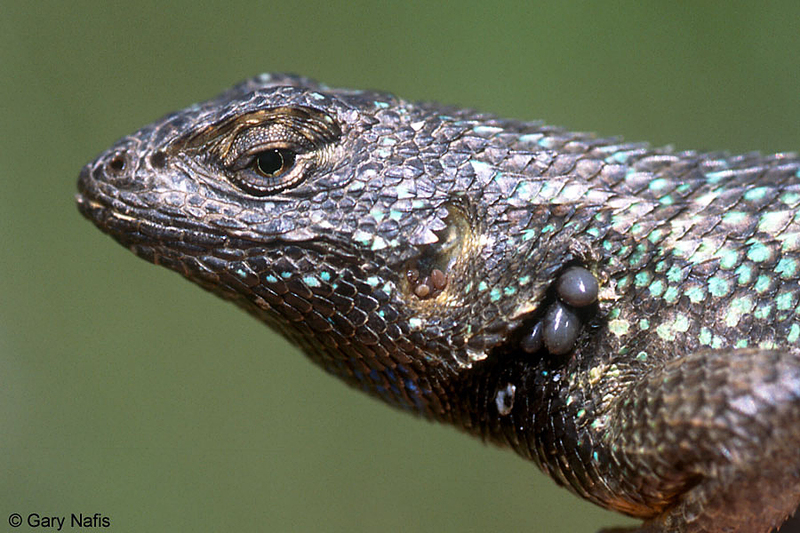 In an interesting twist, UC Berkeley researchers have found that when fence lizards are removed from an area, the population of Lyme disease-carrying ticks plummets. 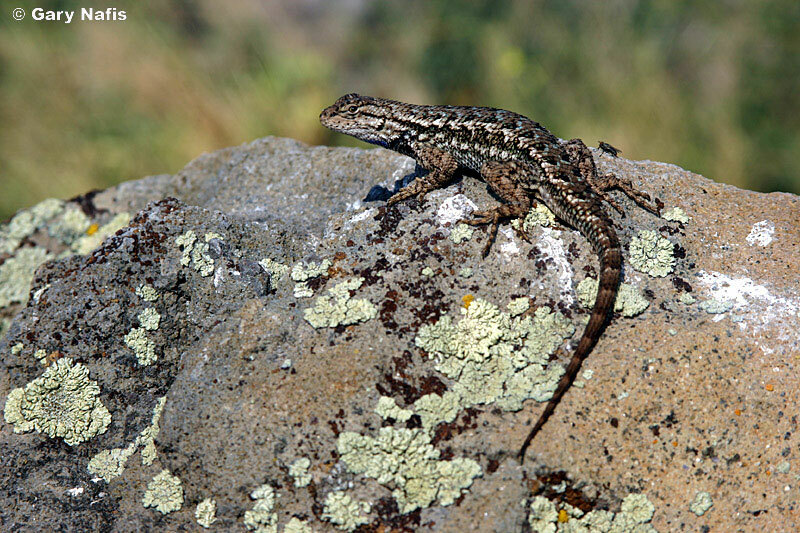 Up to 90 percent of juvenile Western black-legged ticks, the species that carries the Lyme disease bacteria, feed on Western Fence Lizards. 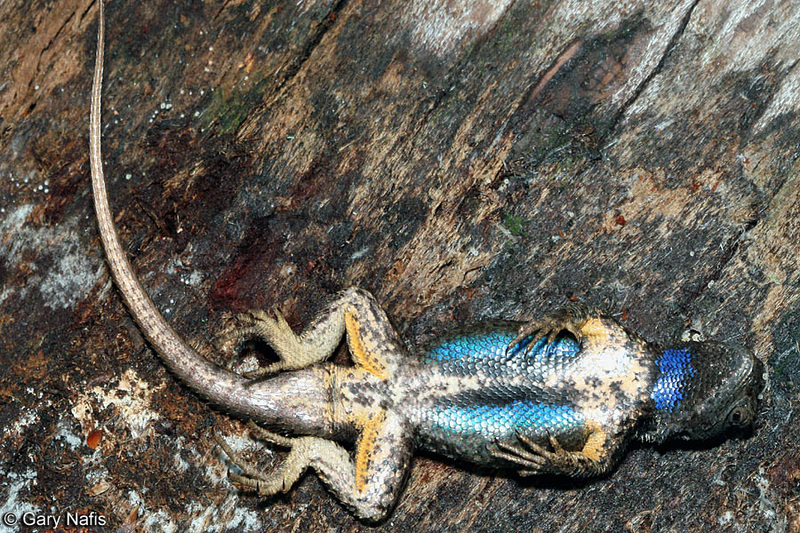 When lizards are no longer available, 95 percent of the ticks fail to find another host to feed on. 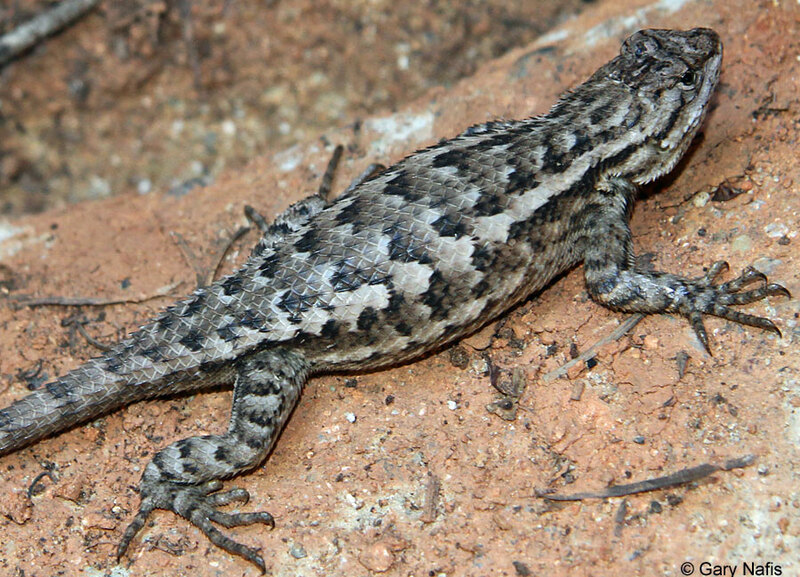 Found in a wide variety of open, sunny habitats, including woodlands, grasslands, scrub, chapparal, forests, along waterways, suburban dwellings, where there are suitable basking and perching sites, including fences, walls, woodpiles, piles of rocks and rocky outcrops, dead and downed trees, wood rat nests, road berms, and open trail edges. 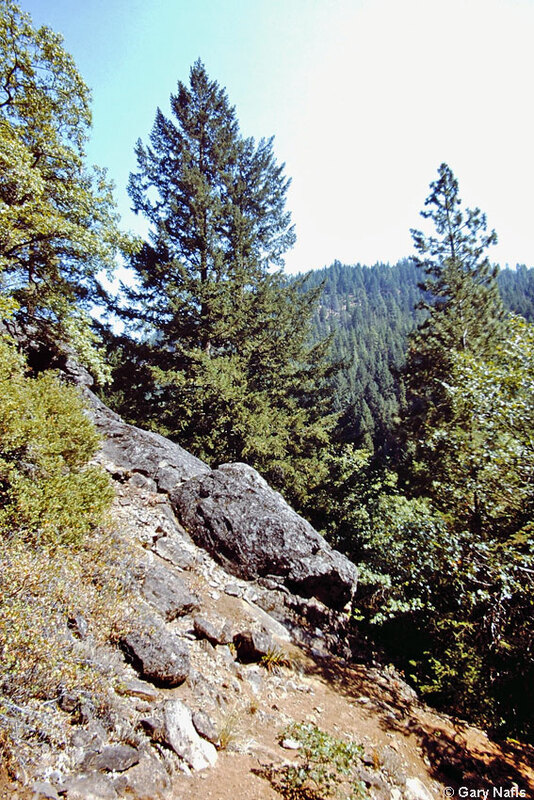 This subspecies ranges from north and east of the San Francisco Bay Area north into Oregon, and Washington. 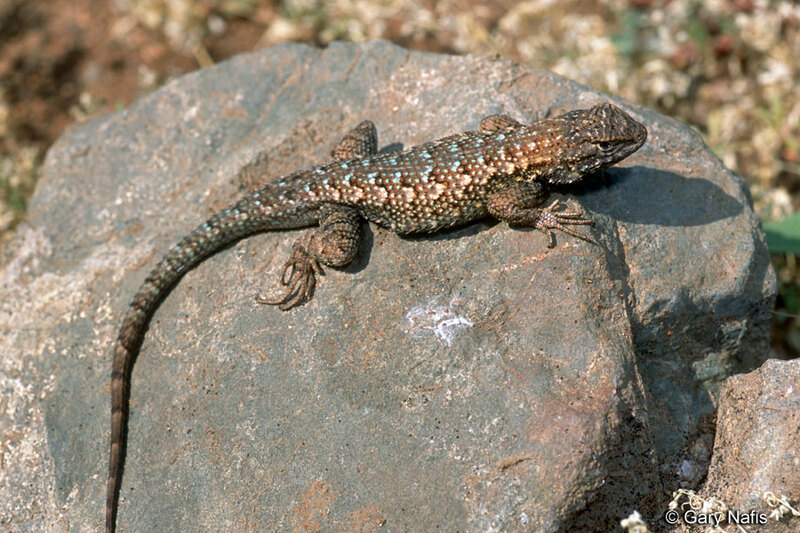 The species Sceloporus occidentalis ranges from northern Baja California north to Washington and east to Idaho, Nevada and Utah. The ranges of subspecies shown on the range map above are based mostly on Ryan Calsbeek's distribution map. An alternate interpretation of the ranges of S. o. longipes and S. o. occidentalis showing S. o. occidentalis present in northeastern California and central Oregon instead of S. o. longipes can be seen here. 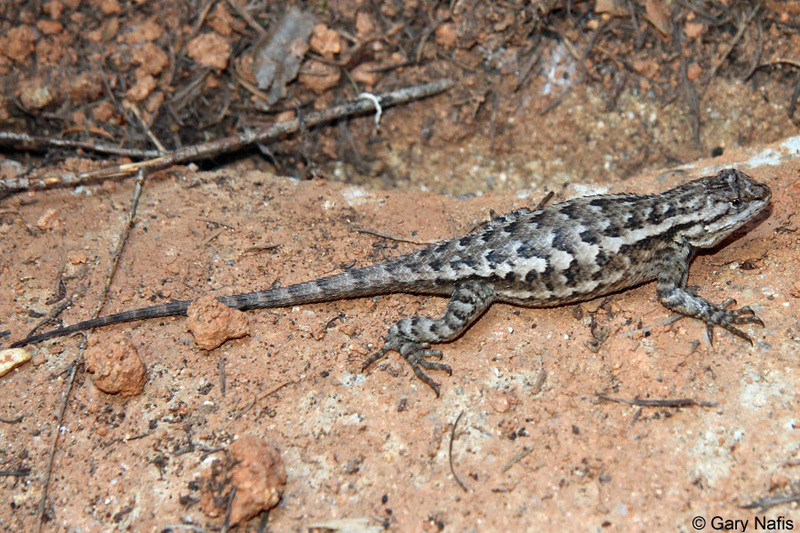 The species Sceloporus occidentalis - Western Fence Lizard, is found at elevations from sea level to around 10,800 ft. 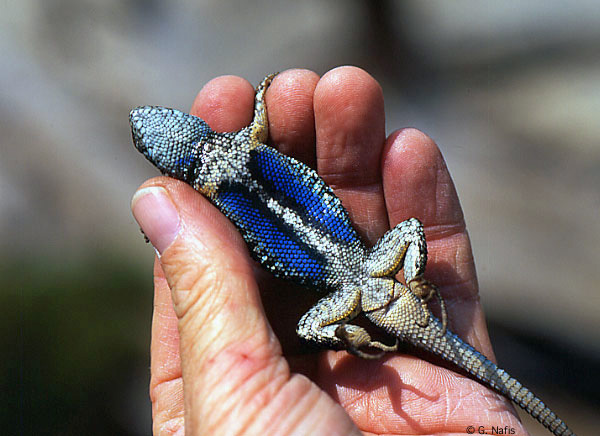 The taxonomy of Sceloporus occidentalis needs to be studied further. 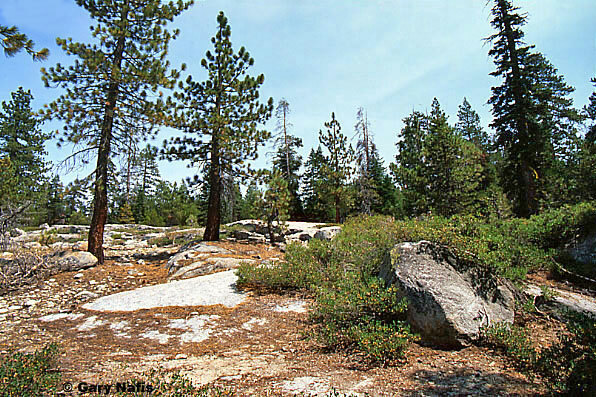 Six subspecies have been traditionally recognized based on geographic variation in morphology, but molecular studies have identified four major clades and eleven different genetic groups in California (James Archie, Cal State University Long Beach). The current taxonomy does not correspond with the ongoing research, so it is certain that in the future the current subspecies and their ranges will be completely revised, probably with several new species described. For this reason some experts no longer recognize any subspecies of S. occidentalis pending further studies. I am taking a conservative approach, retaining all six of the traditionally-recognized subspecies on my list until a definitive study of the species is published and accepted. 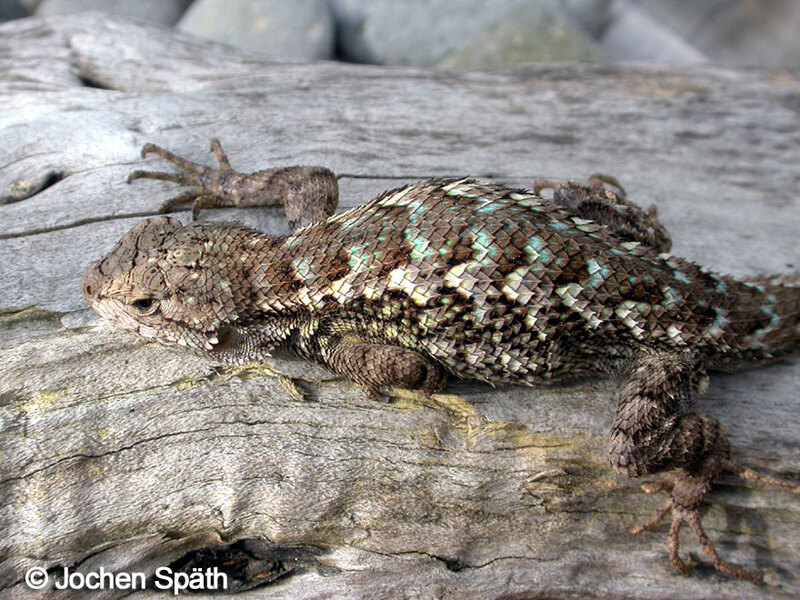 The most recent SSAR Names List (2017) removed the subspecies S. o. taylori and now shows only five subspecies, but many authorities have already accepted research that concludes that S. o. becki, the Island Fence Lizard, is a unique species - Sceloporus becki (Wiens & Reeder, 1997) (Bell, 2001) which would leave only four subspecies of S. occidentalis. Brown et. al. Reptiles of Washington and Oregon. Seattle Audubon Society,1995. S. Morey. 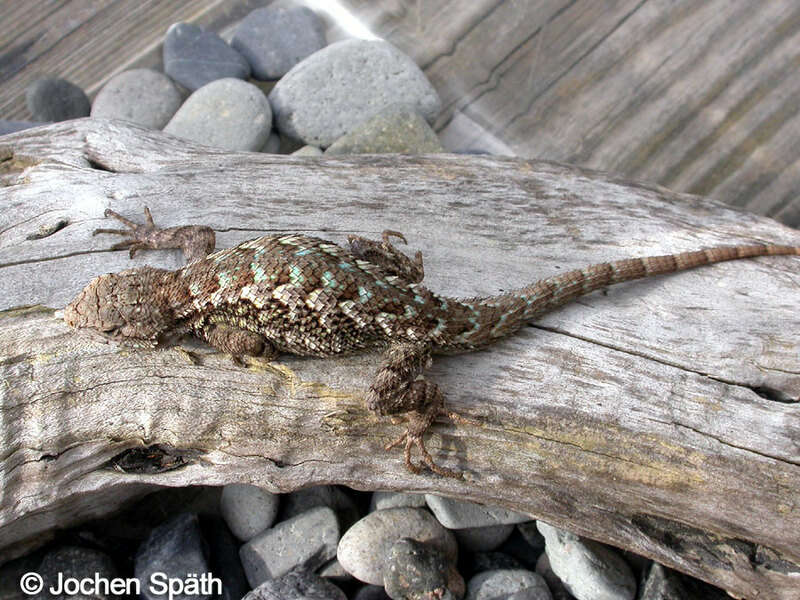 Western Fence Lizard Family: Phrynosomatidae R022. 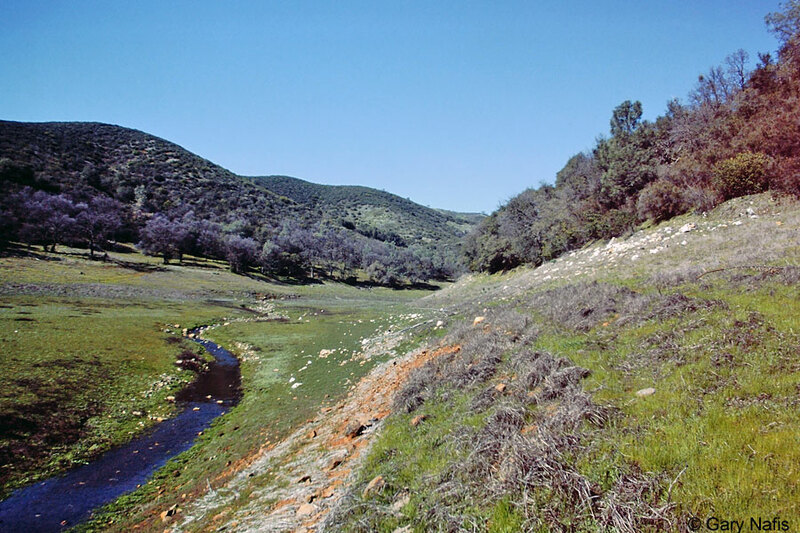 California Wildlife Habitat Relationships System California Department of Fish and Game. Originally published in Zeiner, D.C., W.F.Laudenslayer, Jr., K.E. Mayer, and M. White, eds. 1988-1990.